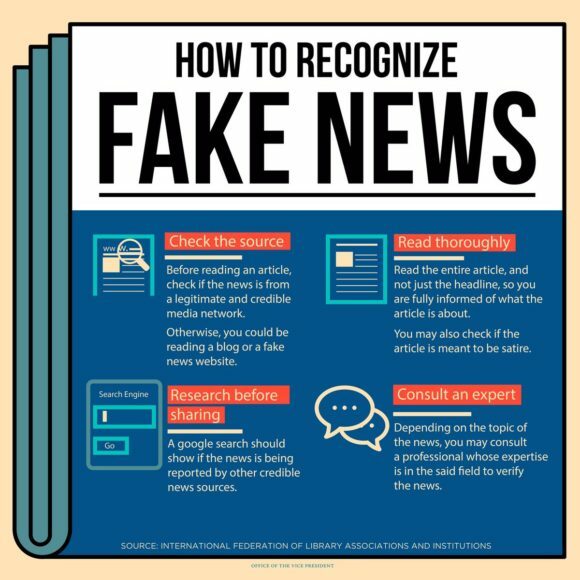 In an infographic titled “how to recognize fake news”, the Office of the Vice President itself became an example of misinformation by making a sweeping generalization that blogs are akin to fake news sites. Check the source. Before reading an article, check if the news is from a legitimate or credible media network. Otherwise, you could be reading a blog or a fake news site. The OVP infographic mentions the International Federation of Library Associations and Institutions (IFLA) as the source. 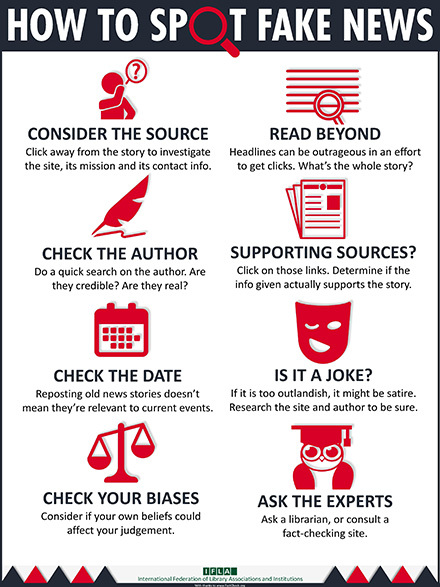 A visit to the IFLA website would reveal a different and more useful infographic on “how to spot fake news”. Important portions of the IFLA infographic were omitted by the OVP in its version. Check your biases. Consider if your own beliefs could affect your judgment. The OVP did not heed this reminder from IFLA. @tonyocruz Apologies for the previous infographic. Thank you for the feedback. We have posted the corrected version. The newly-revised infographic removed the mention of blog alongside “fake news site”. Contrary to what the original infographic’s misinformed claim, blogs and bloggers are credible sources of information too. We go to blogs for reviews of gadgets, hotels, resorts, restaurants, and even current events. We have a whole lot of bloggers awarded by peers for their outstanding and credible work. 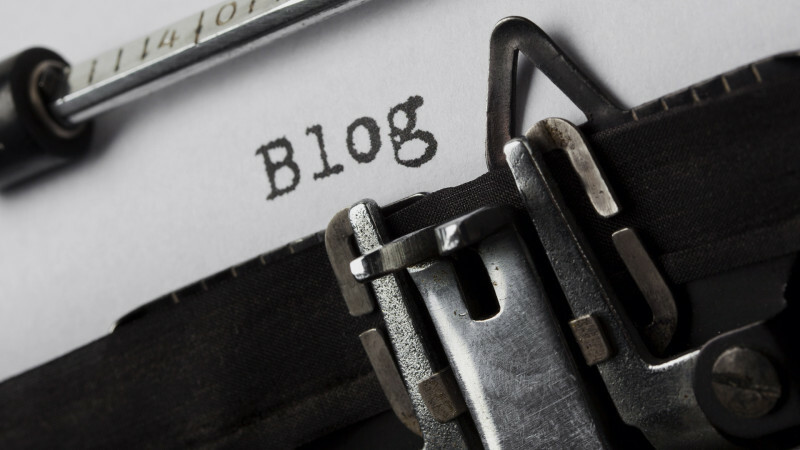 Brands, agencies and government agencies reach out to bloggers to promote their campaigns, products and services in their respective communities. The OVP’s original infographic that cites IFLA as the source. It has since been revised. In many companies and even government agencies, bloggers have been in the forefront of the digital revolution, starting corporate careers and positions such as Digital Marketing Manager, Social Media Strategists, Community Managers and other job titles that they helped establish. Across the Philippines, we have organizations of bloggers like the Cebu Bloggers Society, Cebu Blogging Community, CDO Bloggers, Iligan Bloggers, Davao Bloggers, Davao Digital Influencers, and the like. Other bloggers organize themselves by niche or category, so we would find, for instance, formal and informal organizations of bloggers dwelling on travel and tourism. We also have projects like BlogWatch for citizen journalism, and the annual iBlog summit, which will have its 13th edition this year. Under the previous administration, several bloggers were appointed to positions of power, and helped shape public opinion in favor of the then-president. The former president himself once quoted extensively from and single-out a blogger in his state of the nation address. From the Arroyo to the Aquino administrations, bloggers and other online influencers joined impeachment complaints, started Blog Action Days, and blazed the trail in promoting the use of social media in disaster relief. The introduction of unified hashtags and the full use of social by government and other stakeholders in disaster relief remains an achievement of the blogging and online communities. In many instances, media outlets have relied on bloggers and ordinary citizens for first-hand “coverage” of breaking news, especially during disasters and calamities. The media outlets cannot cover all of the Philippines all of the time, and so they have formed citizen journalism projects that augment their coverage and teach citizens how to properly gather and report the news. All these would not have been possible if blogs and bloggers lack credibility. The OVP should understand that blogs and bloggers deal with information in many ways: by gathering, vetting and making sense of them. Blogs and bloggers serve communities by providing both information and insight they derive from the information. The blogging community has moved forward and by leaps and bounds to “professionalize” the practice of blogging. While no community-wide agreements have yet to be made on adopting a code of ethics, more and more bloggers are adopting policies on Disclosures, Disclaimers, Attribution, and Comments. These ethical considerations help maintain the good relationship bloggers have with their readers. While the staff of the OVP may have had in their minds bloggers who actually publish and spread misinformation, making a sweeping generalization based on those exceptional cases is just wrong. As in instances of plagiarism or the theft of intellectual property, we must treat cases on a case-to-case basis. For example, some fall victim to the allure of “being first to publish” and thereby stand guilty of publishing unverified information. This is especially true for those who use Twitter and Facebook. Their readers and followers would justifiably demand correction and retraction. There are also blogs that deal with political opinions. We hope that the OVP would not brand them as fake news solely because those are opinions critical of the Vice President or supportive of her perceived enemies. In the same way, we ask the President’s supporters not to brand as fake news all opinions that denounce the president. In the marketplace of ideas, both information and opinions are important. It is a tough task to separate fact from fiction, and yet we should be able to benefit from worldwide efforts towards combating the spread of misinformation. Those efforts don’t include the censorship or misbranding of opinions as fake news. If bloggers can review a new hotel room or a smartphone, we sure can apply certain standards to politics, social issues and current events. We have done it fairly and powerfully, as in the case of the Cybercrime Law or in discussions on the Marcoses’ political restoration. Regardless of the medium, bloggers are citizens too who have a right to express opinions. We bloggers are not stupid. We know that political battles rage in the online and offline spaces. The OVP infographic tries to hide this behind the sweeping generalization and its ignorance on the status of blogging and bloggers right now. We respect other bloggers, be they pro-Robredo or pro-Duterte. That is their right. Mere political affiliation with either Robredo or Duterte is not an acceptable basis for putting any or all blogs on the same level as fake news sites. It is baseless, unfair, and also a case of misinformation in itself. Incorrect or false information can only be fought by providing correct and true information. The battle against fake news should not hamper the people from airing their opinions, views and grievances. Come to think of it, the OVP and others who profess to be part of the anti-fake news movement would need bloggers and blogs to promote the just cause of fighting misinformation. The blogs have an audience waiting for that kind of campaign, and it is an audience that knows the concept of credibility and they have since formed communities around their favorite blogs based mostly on the credibility of both the blogs and the blogger. But first, the OVP should heed the IFLA infographic and check its biases against blogs and bloggers.